We’d all love to greet our newborn with a palatial crib in a spacious nursery. The sad reality is if you live in the city or have a small apartment this is just not possible. 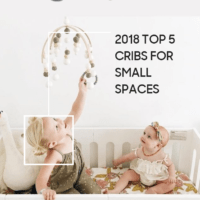 This leaves many parents worrying about how to fit a crib into a small space. Fortunately, cribs today come in all shapes and sizes. There are some great portable and mini cribs that are safe, functional and stylish. Most importantly of all, they will make your baby feel right at home in the smallest of apartments and condos. 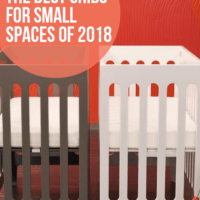 After a great deal of research, we have compiled a list of the 5 best mini cribs of 2019. The Bloom Urban Mini is one of the more stylish small cribs on the market. It really earns the tag “mini” because at just 36.5” wide, it’s smaller than a pack n play! This makes it perfect for apartments, condos and rooms with small spaces. One particularly great thing about the Alma Mini is you can use it like a bassinet. It’s large, lockable wheels allow you to move it right up to the side of your bed. You can also wheel it from room to room. It would get stuck as it’s compact size can fit through narrow doorways and cramped hallways without a hitch. As well as having wheels, the Bloom Alma is also a collapsible crib. It’s really easy to fold up and transport. This makes it a real space saver when your little one’s awake. You can also put it in the trunk and take it with you to the grandparents! The only real downside to this one is the price. It’s more than twice the price of other mini baby cribs. And that’s just for the “Frame”, the mattress and sheets need to be purchased separately. However, this is perhaps the best portable crib on the market. And it’s collapsible too. If these two features are important to you, it’s probably worth the extra money. The Alma Mini is a very compact crib. It can still accommodate an infant until they are 35” (around 1-year-old). Can be wheeled from room to room. Fits through tight doorways and hallways. Easy to fold, and just 10” wide folded. You won’t need to worry about your pets knocking it over. The mattress can be on two different levels. On the lower level, your infant can sit-up safely. Comes in 5 stylish all wood designs. Just attach the lockable wheels and it’s ready for action! At 60 lbs, it’s on the heavy side. Though it wheels easily and is hard to knock over. The Child Craft London Mini is another great small crib. At 43.3” long, it’s around 9” shorter than a standard sized crib. This makes it ideal for when space is at a premium (such as with twins). What I really like about this model is it has a wire spring base. Most modern designs have a flimsy board under the mattress to provide support. Over time, the wood can warp and is not responsive to a baby’s position. Wire spring bases were popular around 30 years ago. They were probably phased out due to cost issues. So, it’s nice to see Child Craft bringing them back. The Bloom Alma is also a convertible mini crib. It converts to a twin bed so it will grow with your baby. Meaning you can use it for longer and get good value for money. Another big plus this is a low profile crib. After my assisted delivery, I realized just how painful it is grabbing a baby from a crib. This model is slightly lower. 5-foot tall mothers have commented on how easy this makes things. The only drawback with the London Mini is it has no wheels. There is a 3” thick mattress included in the price. DaVinci makes stunning cribs. 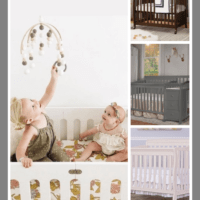 Their Emily Mini Crib is another example of their stylish yet functional designs. At just 38” by 28” by 28” it’s a perfect crib for small spaces. What really sets this design apart is it has three adjustable mattress levels. Most small cribs have just the two. The highest level allows your newborn to be at eye level so you don’t need a bassinet. The Davinci Emily can be used up to 50lbs. 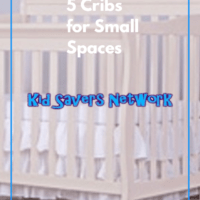 This is a bit longer than other mini cribs so you get more bang for your buck. Parents have reported their toddlers sleeping using this one until they’re two years old. As always, it depends on the size and inclination of your baby! If this had wheels or could fold it would be the perfect crib for apartments and condos. It is relatively light, so many parents are scooting it from one room to another without problems. For its low price, the Davinci Emily could well be the best mini crib for the money! The Aiden is a great mini crib from Dream on Me. It’s a really compact crib which only takes up 2′ by 3′ of floor space. 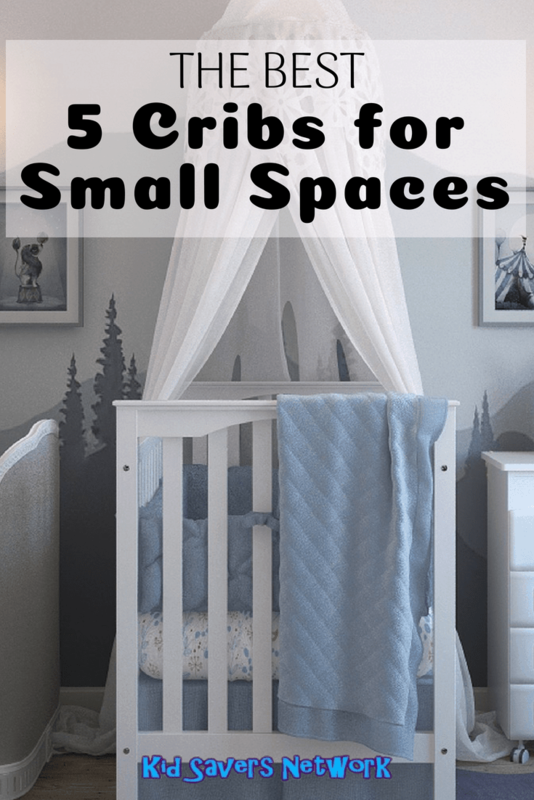 This makes it one of the best cribs for small spaces. The Aiden Mini Crib also grows with your baby as it converts to a toddler bed and then a twin size bed (rails not included). This is good news as most mini cribs only last until one year old. Another big plus is it’s made from solid pine wood and not the flimsy particle boarding that most modern cribs have. A lot of mini cribs only have two adjustable mattress heights, too. The “Aiden” has three so you can use it with newborns. 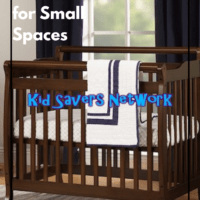 This removes the need to buy a bassinet and helps save money. As with a lot of small baby cribs, there is a 1” mattress included. Many parents find it too flimsy and we suggest buying the Dream On Me portable mattress instead. Not having wheels is a drawback, but it’s lightweight and easy to move around. For the price, the Aiden Mini Crib definitely punches well above its weight. The Delta Portable Mini Crib is 35% smaller than standard cribs, so it’s a real space saver. It also has lots of great features apart from its small stature. It folds and has wheels so you can save a lot of space. 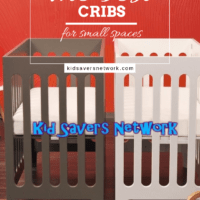 You can also move the crib easily from room to room which is a feature many parents love. Being nice and compact it will easily fit through narrow doorways and hallways. The 2 position mattress transforms the crib into a bassinet, playpen and changer. Unlike similar designs, the front gate can move up and down. It locks in both positions so it’s easy and safe to move your baby in and out of. This also allows you to used the crib as a changing table if need be. Delta provide a free 1” crib mattress but many parents are ditching it in favor of the Dream on Me 3” mattress. You can still get good use of the mattress as a play mat. If you’re looking for an affordable crib, this is the one for you. It’s also great if you have a small apartment or condo. Due to its low price, it’s great for leaving at the Grandparent’s, too. Be sure to check out our pages on crib mattresses and baby pillows that won’t cause flat head.